Microchip's Ethernet solutions are designed to support the growing needs of networked monitoring and control applications with a full complement of robust, highly integrated Ethernet devices complemented by a full line of PIC32/SAM MCUs and SAM MPU host processors. Microchip's 10/100/1000 Mbps Ethernet PHYs are high-performance, small-footprint, low-power 10Base-T/100Base-TX/1000Base-T transceivers designed specifically for today's consumer electronics, industrial and enterprise applications. These devices feature Energy Efficient Ethernet (IEEE 802.3az) and Wake-On-LAN functionality, which provide system sleep modes for improved power savings. 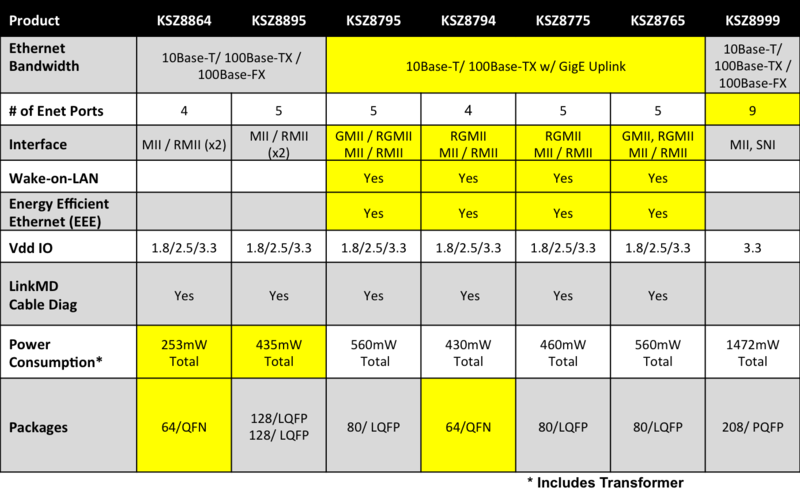 These devices have the industry's smallest footprint and consume up to 40% less power than existing transceivers. They have an integrated voltage regulator and ESD protection components to help reduce Bill of Material (BOM) costs. 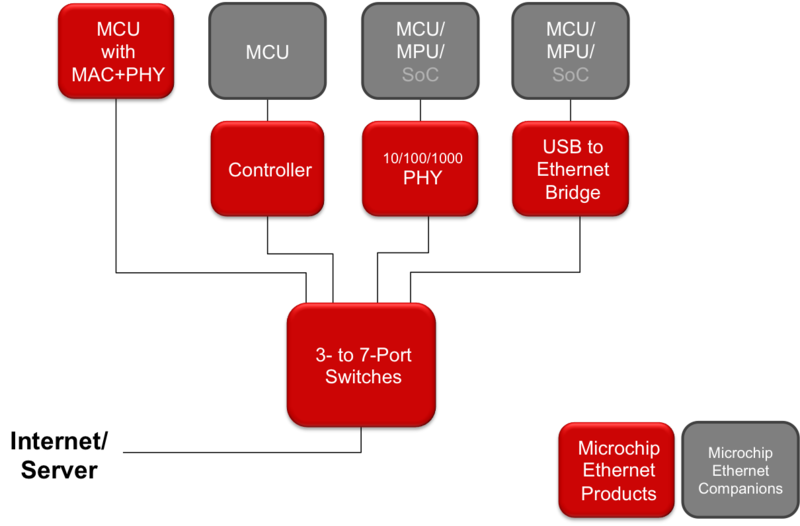 Microchip's Ethernet 10/100 Controllers include an integrated Ethernet MAC and PHY with a high-performance SRAM-like slave interface as well as support for external MII and PCI interfaces. The simple, yet highly functional host bus interface provides a glue-less connection to most common 16-bit microprocessors and microcontrollers as well as 32-bit microprocessors with a 16-bit external bus. The controllers are also available with variable I/O voltages and multiple package options. 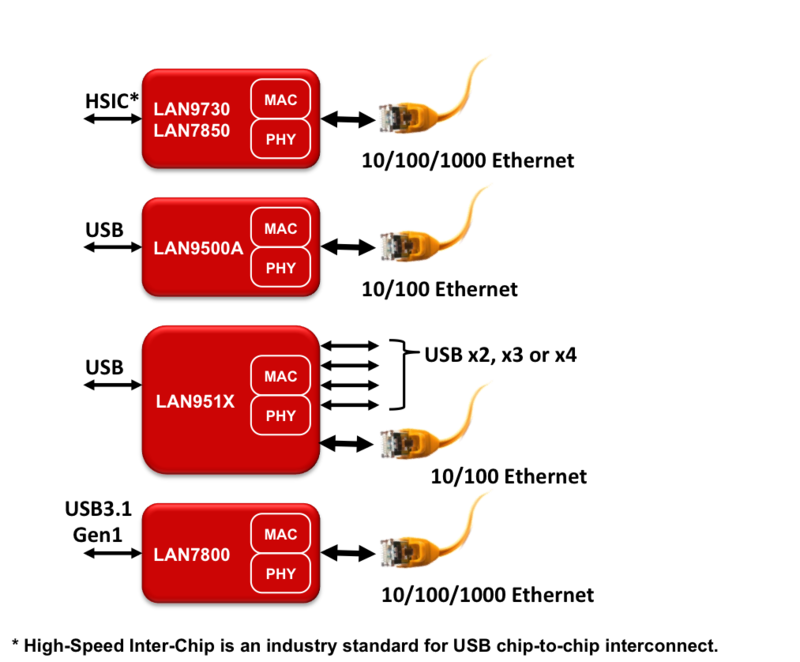 Microchip's switches are high-performance, small-footprint, full-featured 3- to 9-port Ethernet switches. Applications ranging from IoT consumer electronics, computing, Industrie 4.0 factory automation, and automotive designs are supported with innovative features and robust high-temperature operation. Rapid development cycle and low-cost are enabled through our design check services and software drivers. 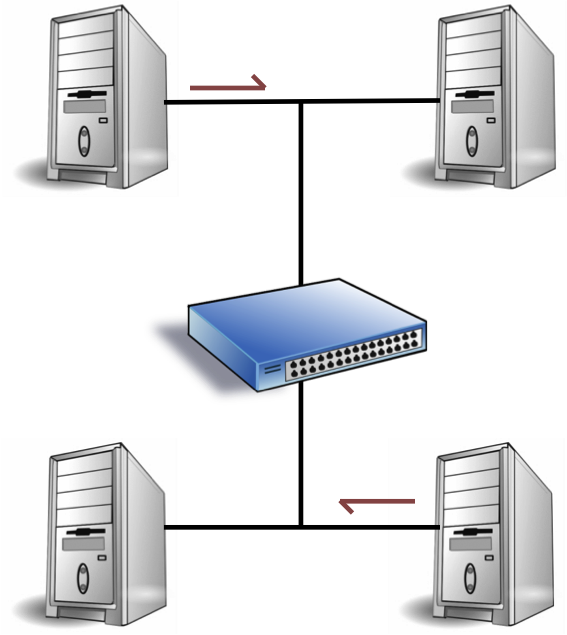 The basic functionality of a switch is to connect multiple Ethernet devices to each other, forming a network. 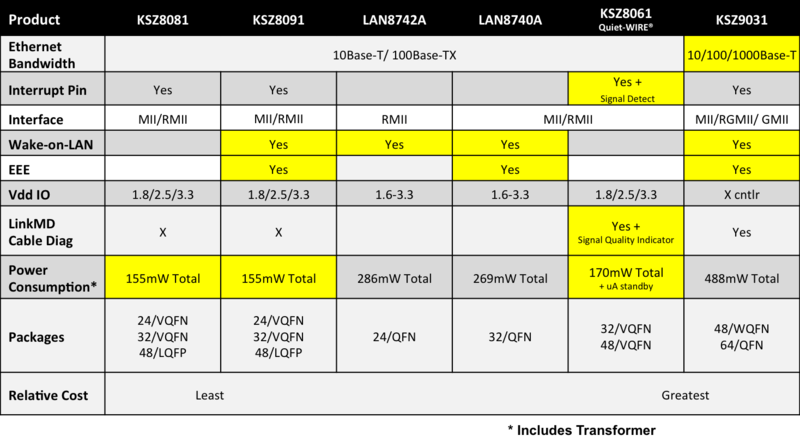 Switches help facilitate the grouping of multiple Ethernet devices that communicate in Full Duplex mode. Many set top boxes have Wired and Wireless Ethernet connections. The simplest way to do this is to use a three port switch. 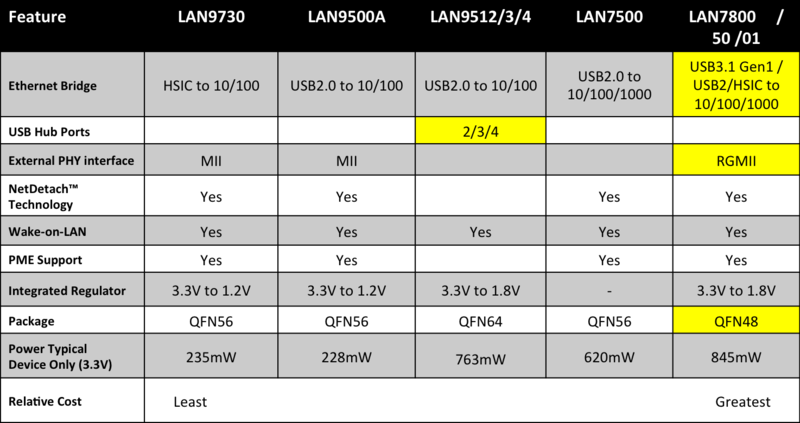 One with a PHY going to a wired connect, another MAC going to a wireless receiver, and the final MAC going to the SOC that controls the set top box or TV controller. With VOIP systems, there is usually an Ethernet port and an Internet port, with the SOC filtering off the VOIP data to use with a regular phone. This requires a switch to implement. In industrial systems, rugged and redundant Ethernet connections are desired due to the cost of having to put the lines down to fix a break. It also ensures that all devices are connected to a system for proper operation. 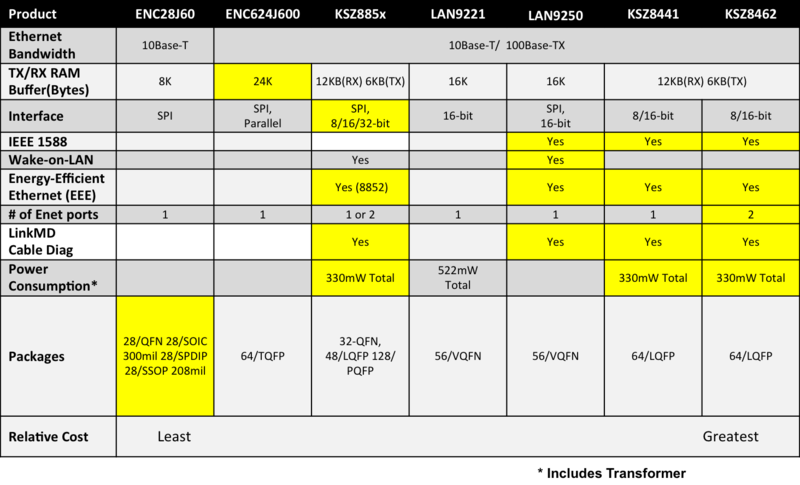 Ethernet is also useful as a good SOC to SOC bridge since all software is already compatible with the Ethernet standard. Microchip’s Ethernet solutions are designed to support the growing needs of the Ethernet connectivity markets with a full complement of robust, highly integrated Ethernet MCUs. 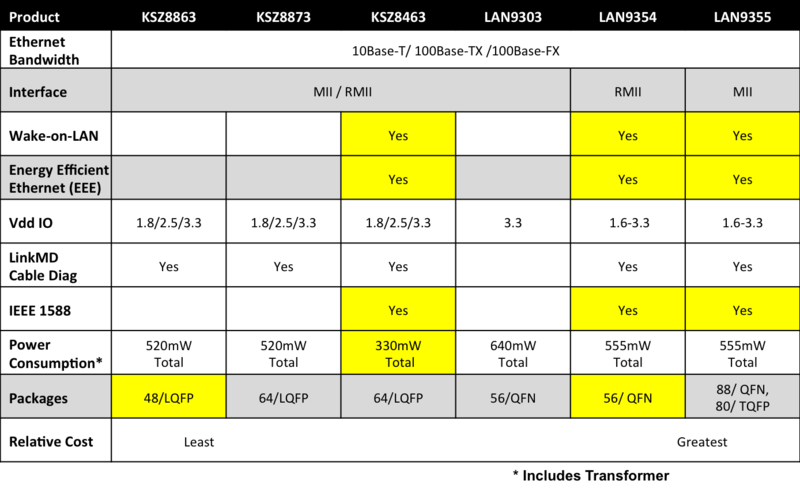 Microchip’s PIC32 and SAM MCU/MPU families offers 10/100/1000 Mbps Ethernet MAC options with industry standard PHY interfaces. 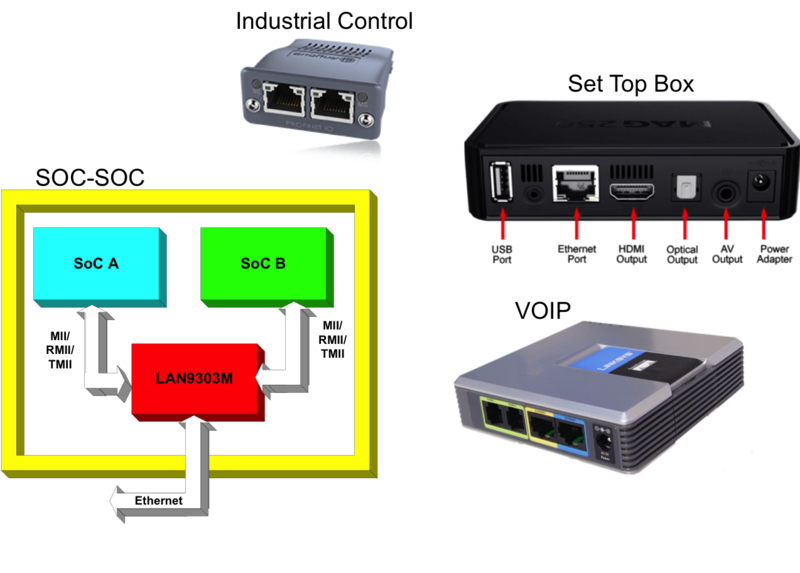 The solutions enable easy network connectivity for cost sensitive embedded designs by providing free and robust TCP/IP stacks. A notable exception is the PIC18F87J60 MCU - having both a 10Base-T MAC and PHY on-board. Ethernet for control automation technology (EtherCAT®) is a high-performance Ethernet-based Fieldbus system. Its main development goal was to apply Ethernet to automation applications, which require short cycle times and low communications jitter. The EtherCAT protocol is an open standard currently managed by the EtherCAT Technology Group. Microchip Technology, a leading provider of microcontroller, analog mixed-signal and Flash-IP solutions strengthens its commitment to the industrial space with the licensing of the EtherCAT® technology for next generation Ethernet controllers.